Murphy and I would like to wish you a happy Wednesday! My week has been going well so far, except for a cold I’ve developed. I’ve had less meetings after work this week and with Thanksgiving coming up, a short break is on the horizon! Woo hoo! Today is What I Ate Wednesday hosted by Jenn at Peas and Crayons! My eats this week have been a little more diverse than usual. I’ve been getting fuller a lot quicker for some reason, so I’m not sure what that’s about. Could be some of the new food I’m eating. Friday night I didn’t feel like cooking (let’s face it- do I ever? ), so hubby and I grabbed some food from Q’doba. I don’t go there a whole lot, so I wasn’t exactly sure what to order. Although I studied abroad in Mexico, I’m not a huge fan of Mexican food in general- too many beans and tortillas does not make my stomach happy. 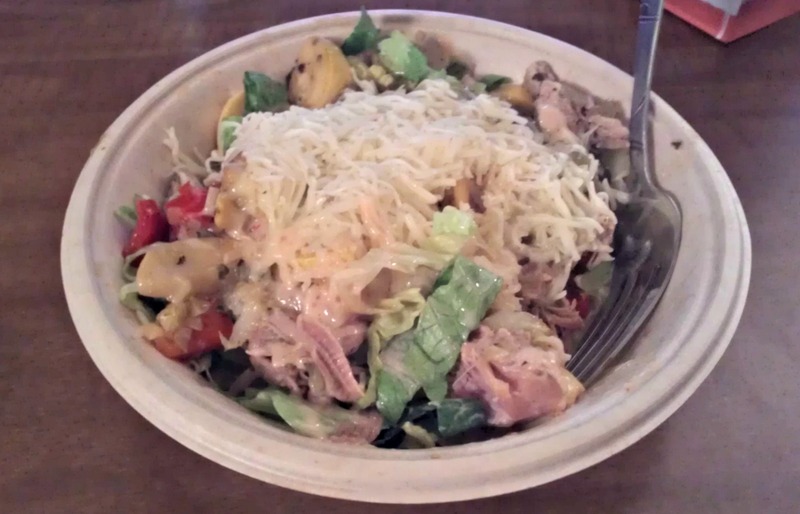 I ended up going with the naked pork burrito bowl with lettuce, grilled veggies, salsa verde, and cheese. It was really good except that the grilled veggies made the lettuce kind of watery. The leftovers weren’t so great. I am in love with my mini lunch crock pot. I received it last Christmas and forgot about it until recently. It’s perfect for taking soup or chili to work. You simply plug it in and your food will be nice and hot whenever you eat! It’s main use it just heating because the food needs to already be cooked. It’s really convenient for taking leftovers to work. I took my leftover baked potato soup (a la Skinnytaste) last week. I’ve been on a popcorn kick lately. 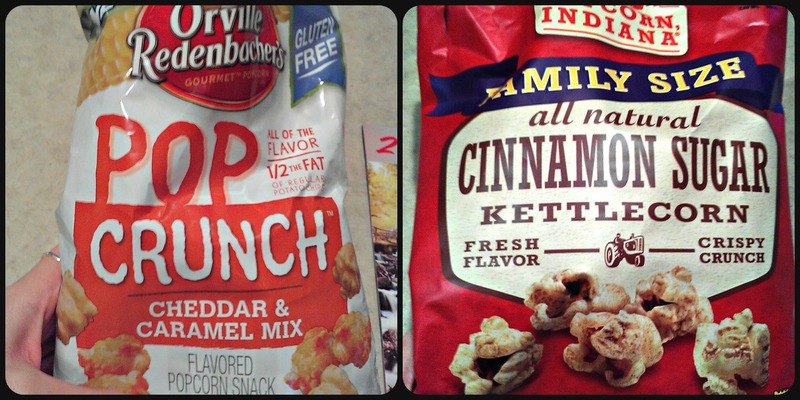 Not just plain old popcorn though, Pop Crunch Cheddar & Caramel Mix from Orville Redenbacher’s (such a good combo!) and Popcorn Indiana’s Cinnamon Sugar Kettle Corn. YUM. I picked up some cinnamon chips at my last grocery store run. I never bake with cinnamon chips, so I wasn’t completely sure what to use them in. 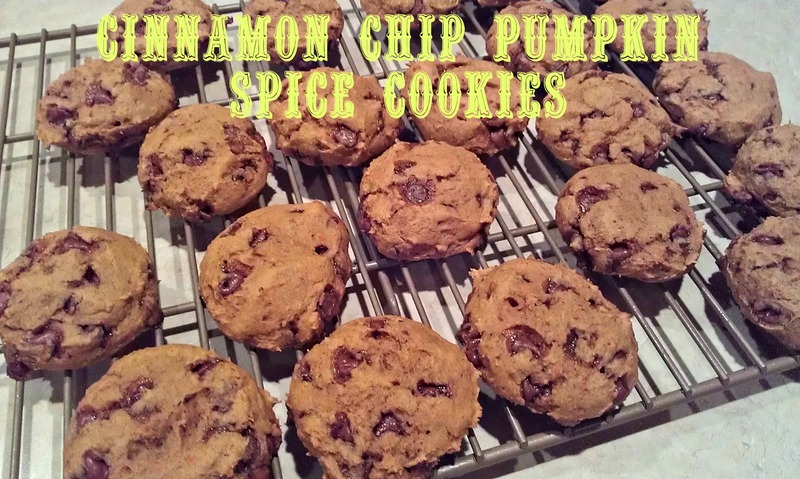 After perusing Pinterest, I decided on Cinnamon Chip Pumpkin Spice cookies from I Heart Nap Time. 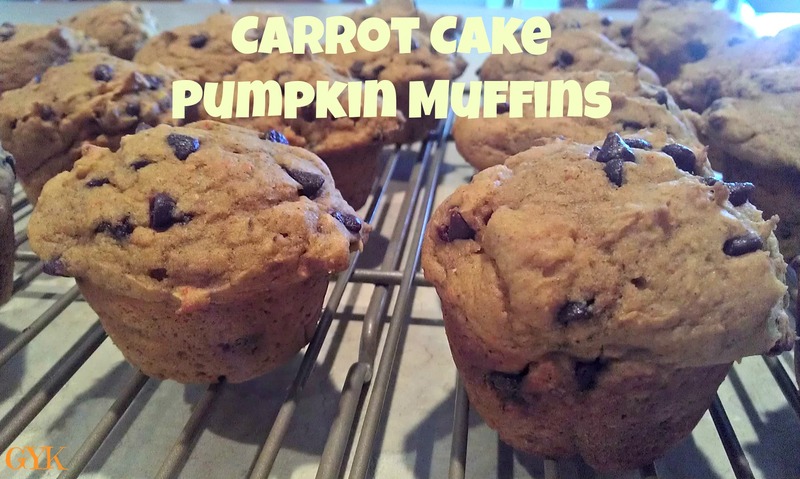 They are really similar to the carrot cake pumpkin muffins I make often (just substituting cinnamon chips for mini chocolate chips and adding pudding mix). Make sure to bake the cookies the full 10 minutes. I under baked some of batches of mine and they’re a little soft (more “muffin” than “cookie” like). Last night I enjoyed a little Centergy. I’m continuing to rehab my IT band with active exercise (thank you for all the advice!!) and am working on getting new running shoes. I think there may be a benefit to getting my feet refitted for running shoes. 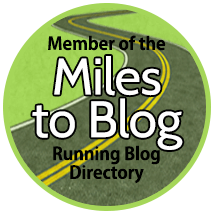 I’m curious what the other running store in my area will recommend for shoes. I’m definitely not hating the opportunity to look at new running shoes lately! Keep calm and have a wonderful Wednesday! Plain or flavored popcorn? Like or dislike Mexican food? 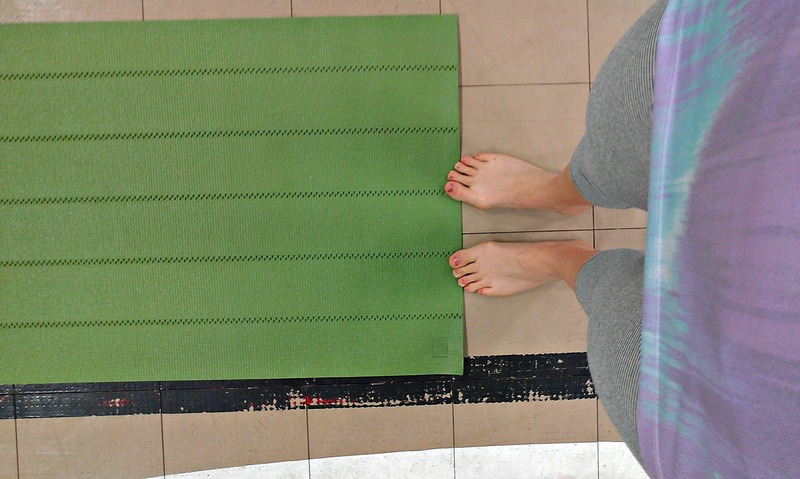 Favorite fitness class this week? 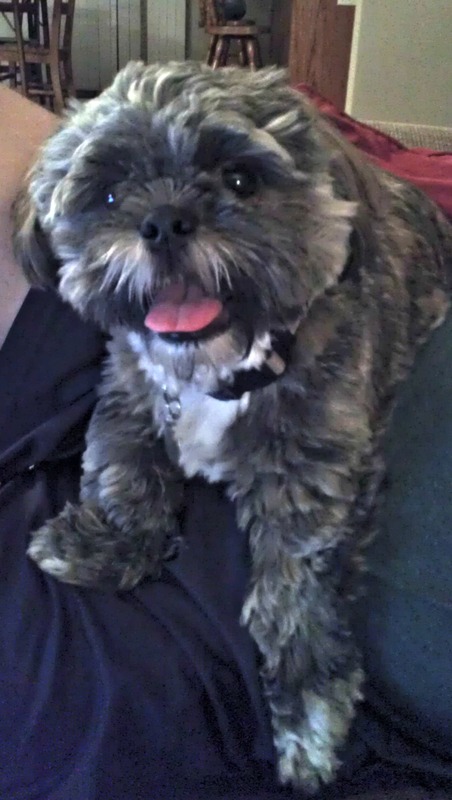 Murphy & I wish you a happy middle of the week! 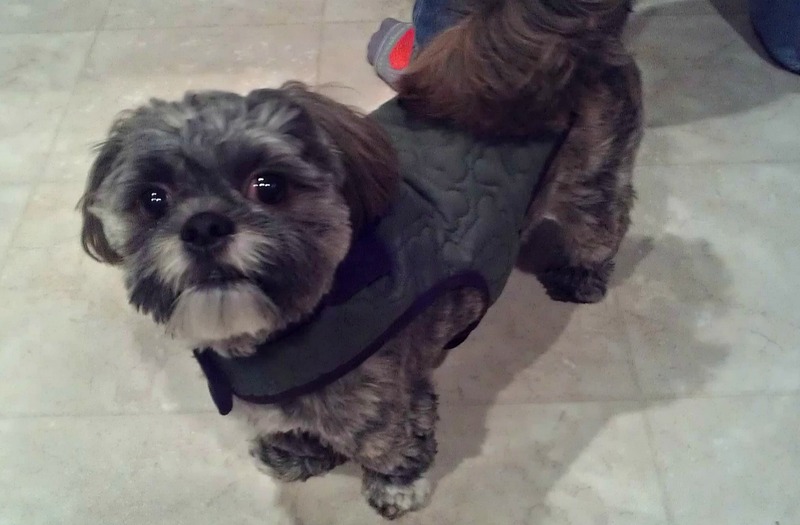 The weather here has gotten noticeably cooler so I subjected Murphy to wearing his cute jacket. He actually doesn’t mind wearing it. I may or may not put it on him just so I can laugh at how cute he looks. 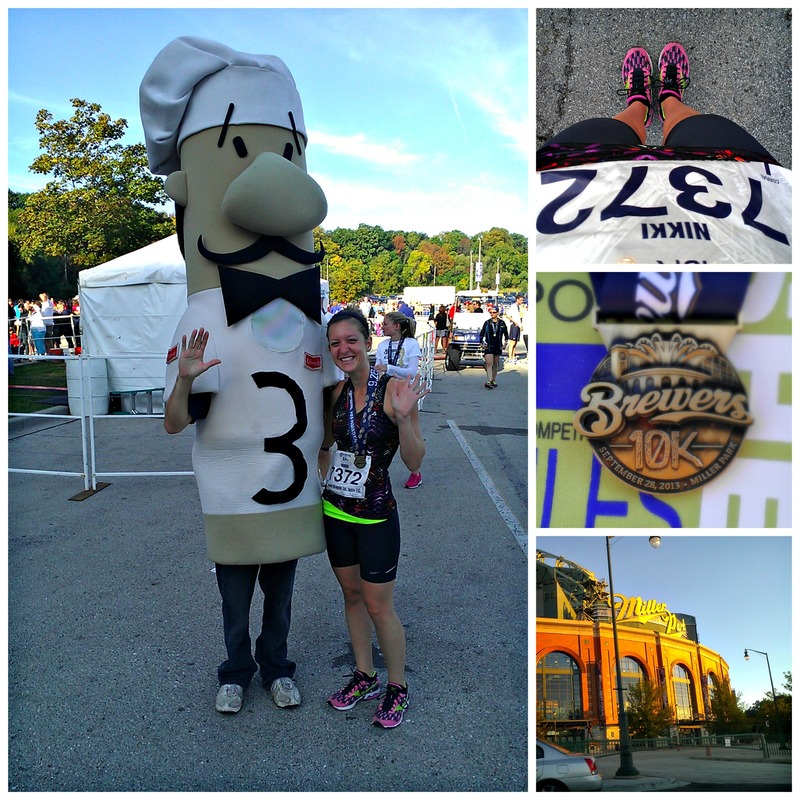 Today is my second favorite link up day, What I Ate Wednesday! (hosted by Jenn at Peas and Crayons). 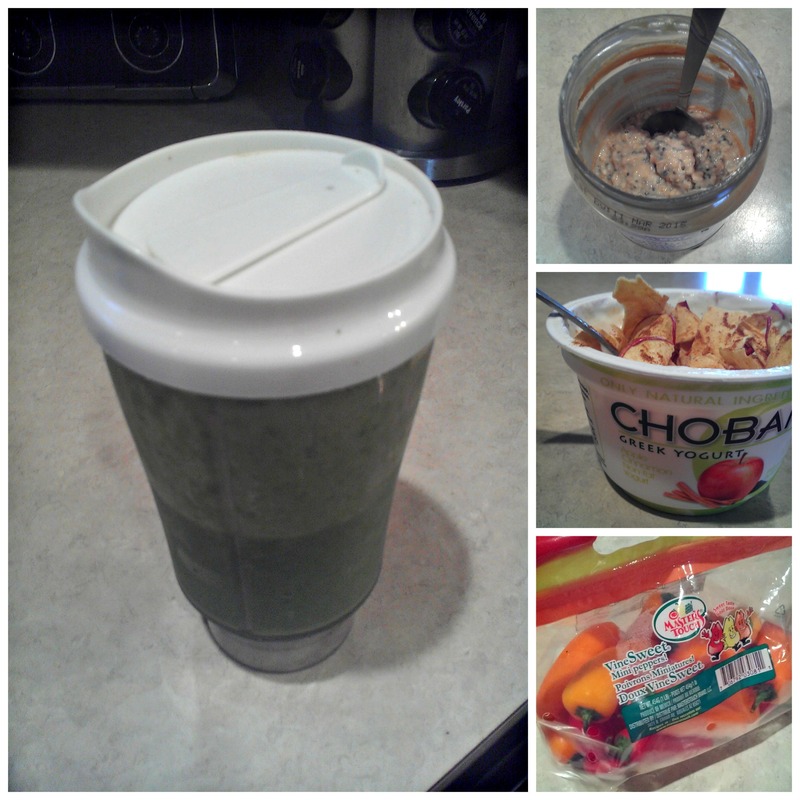 Below are my favorite eats from this week! Last Saturday, hubby and I went out for dinner at a local eatery, The Kangaroost. The Kangaroost originally started as a food truck and now is a brick and mortar restaurant. They serve “gourmet comfort food with local flair.” You can taste such a difference with local, fresh ingredients. I seriously love this place. 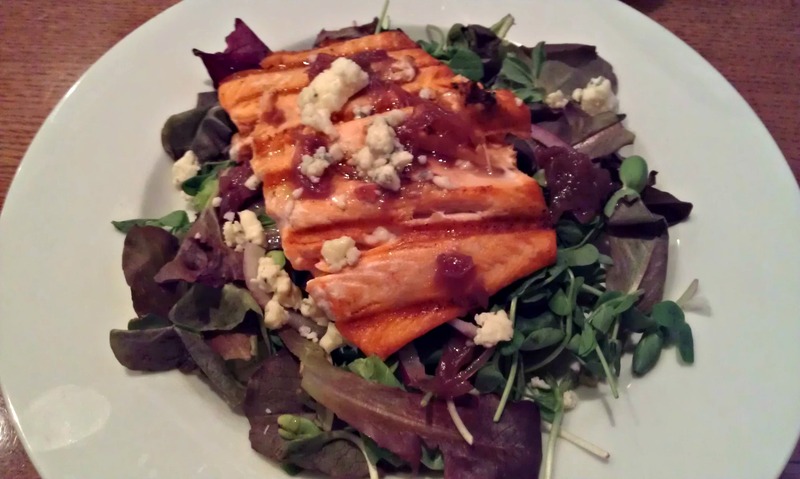 I had the Maple Glazed Salmon Salad with Gorgonzola Cheese and Citrus Vinaigrette. Their breakfast is amazing too (try the Happy Bellies oatmeal pancakes)! Hubby picked up some bagels at Panera to bring to work for his birthday. I managed to sneak in a request for a pumpkin pie bagel for moi. It was really good, which means a lot coming from someone like me who doesn’t eat much bread. 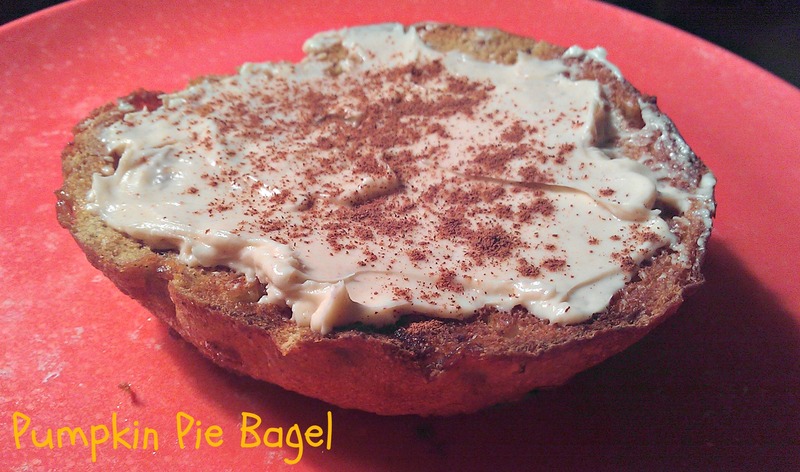 I topped it with Laughing Cow Cinnamon Cream cheese wedge and a sprinkle of cinnamon. So good! A more typical breakfast for me in the morning continues to be oatmeal. I stir in 1 TB of chia seeds, sliced banana, and a scoop of peanut butter. It’s filling and satisfying, especially for these cold mornings lately! 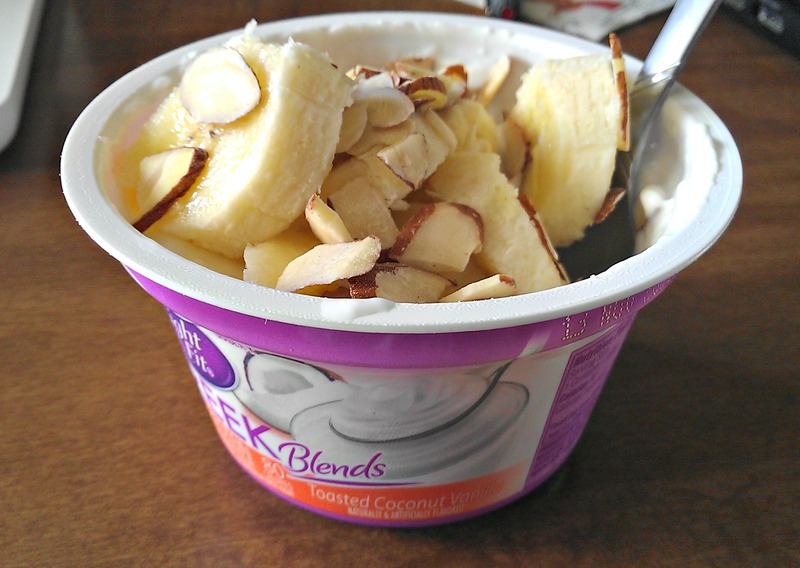 I recently tried the Light & Fit blended greek yogurt. I really like that the flavor is already mixed in. I love the banana cream and orange cream varieties. I usually top the yogurt with sliced almonds. We’ll end with a dessert because all dinners should be finished with some kind of dessert! Gotta treat ourselves a little too! Last week was our second anniversary and hubby’s birthday. Since it’s just the two of us, I picked up a small cake from a local bakery. I took a chance and selected the Snickers Treat pudding cake. I thought it looked really hard, but it was soft once I cut into it. A small slice was all that was needed though because it’s a pretty rich cake. Hubby liked it and that’s all that mattered! I’m going to a free running clinic tonight, hoping to get some tips on transitioning to winter running and staying injury free! I’m planning on running outside as long as I can this winter!!! What’s your favorite kind of birthday cake? Do you have a little dessert every night or a lot of dessert one night? 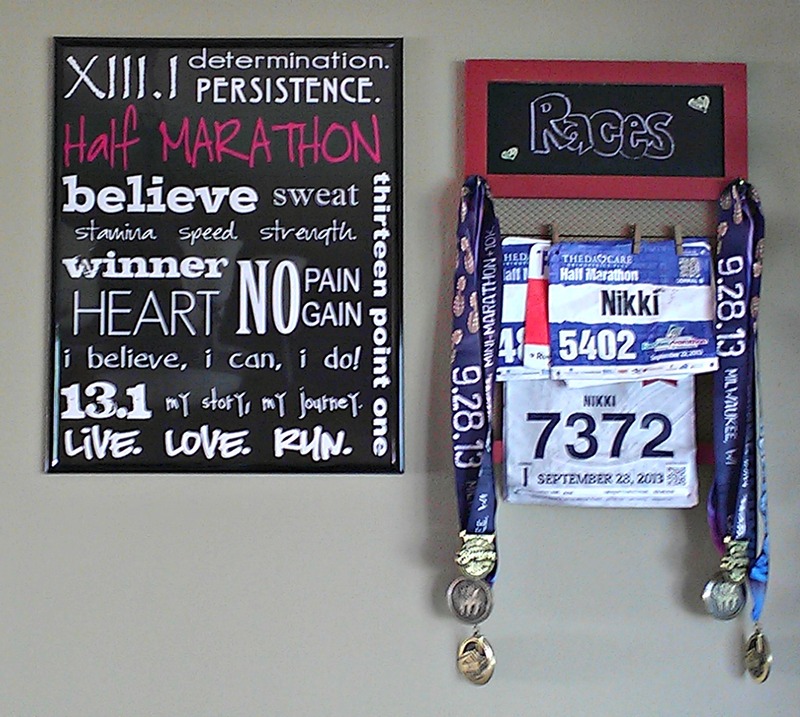 Will you be running outside this winter? Hope everyone is having a good week! 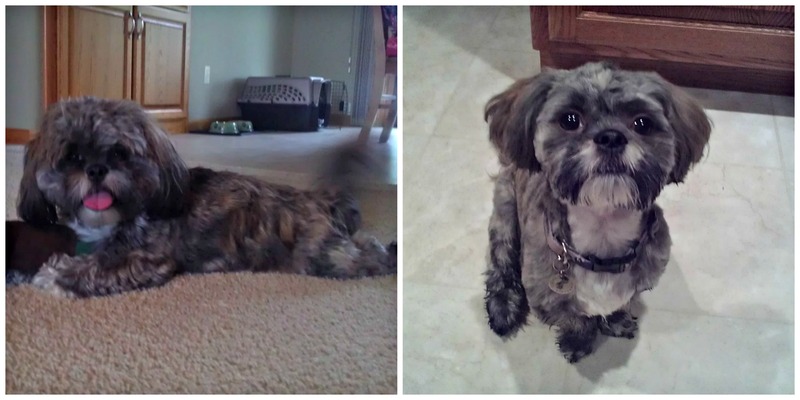 This little guy got a haircut this week! He always looks like a brand new pup when I pick him up from the groomer’s. His hair grows so fast! It’s been a colorful, fall week of food in my house. 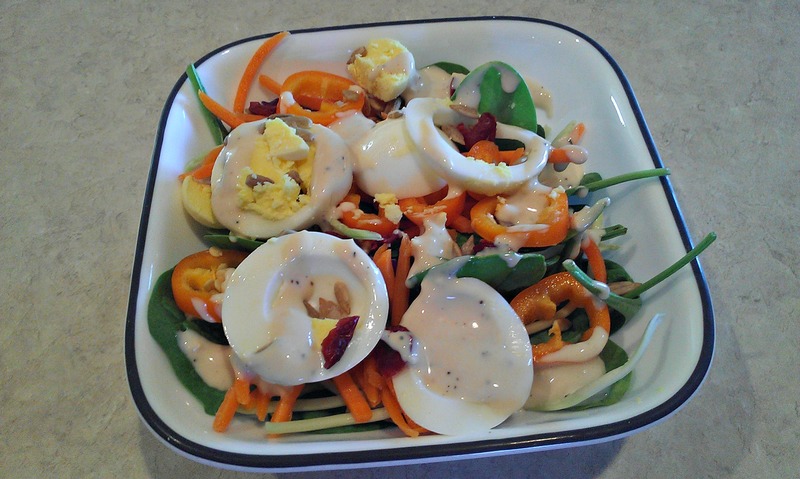 I follow mostly a low fodmap diet and try make my breakfast and lunches primarily fruits and veggies. Here are the food highlights from my week! I always underestimate a good green monster smoothie. I love to have one for breakfast or after a great workout. I’ve saved produce like spinach and kale by freezing it and using it in my smoothies. I hate to think of the produce I used to throw away! I was excited to use up a jar of peanut butter to make hot oats in a jar! 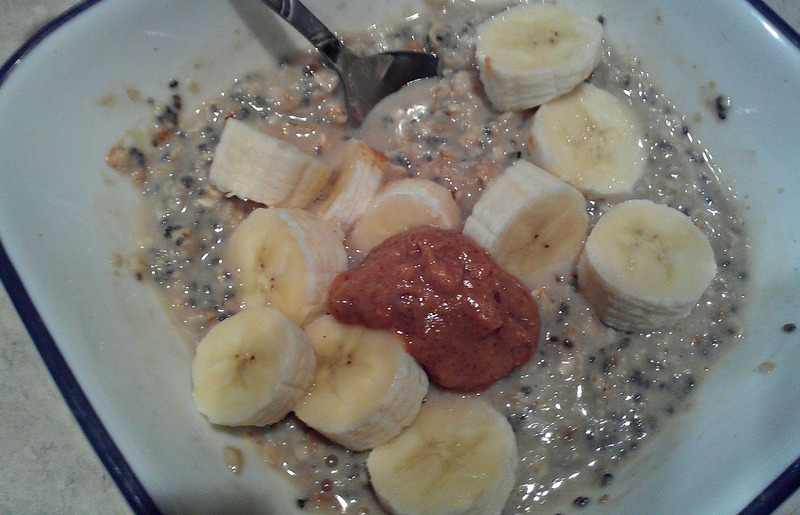 I threw in chia seeds, bananas, cinnamon, and there was obviously peanut butter left in the jar! My snack between lunch and dinner is usually greek yogurt. I topped Chobani Apple Cinnamon greek yogurt with dehydrated apples and cinnamon. 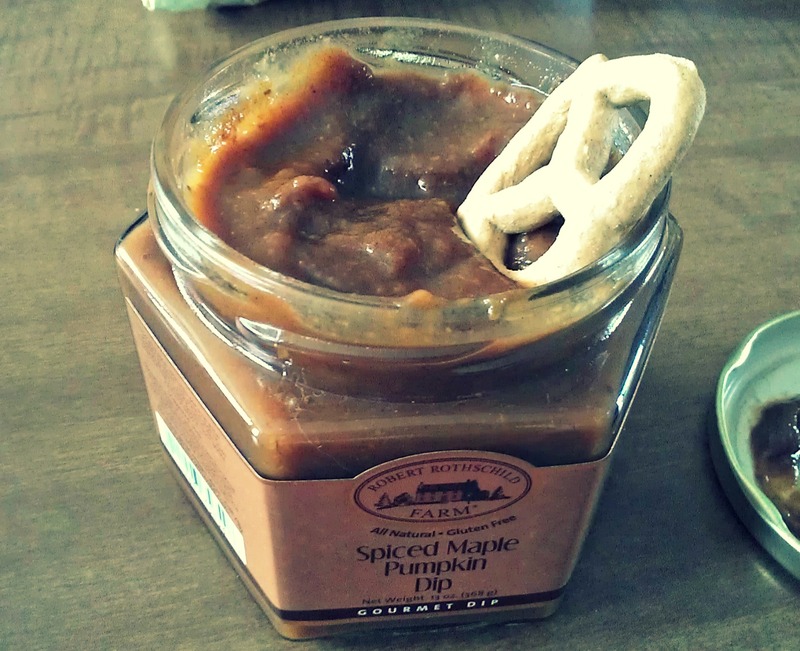 Unfortunately, I probably won’t be eating this again because apples have been giving me stomaches…and they are a no-no on a low fodmap diet due to fructose. Livin’ and learnin’ over here. I picked up some vine sweet mini peppers on sale at the grocery store. I’ve never had them before and I’ve been missing out! I love them! They are small, cute, and taste really good by themselves or on a salad. Every lunch for the last couple weeks has been some form of a spinach salad and a kiwi. I’m obsessed, but I don’t care! Keeps me full and energized throughout my afternoon! 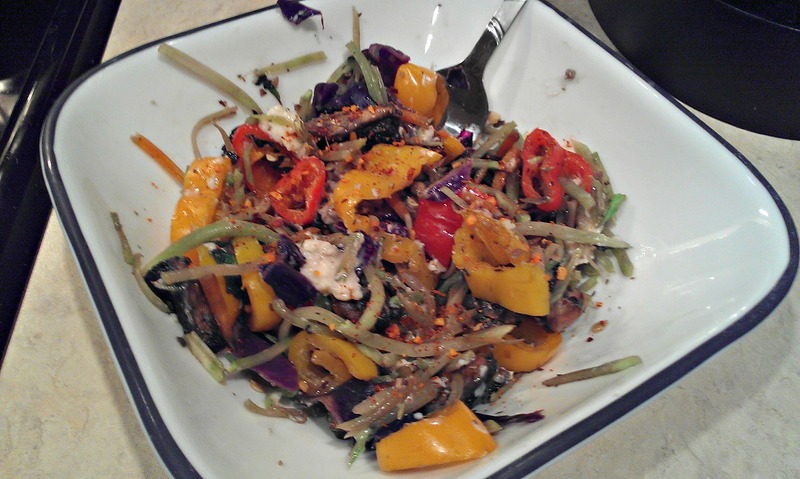 My favorite dinner last week was a saute of mini bell peppers, broccoli slaw, portabella mushrooms, a wedge of laughing cow cheese, and sprinkle of cajun seasonings. It was colorful and delicious. I picked up some pumpkin spice M&Ms to bake with. 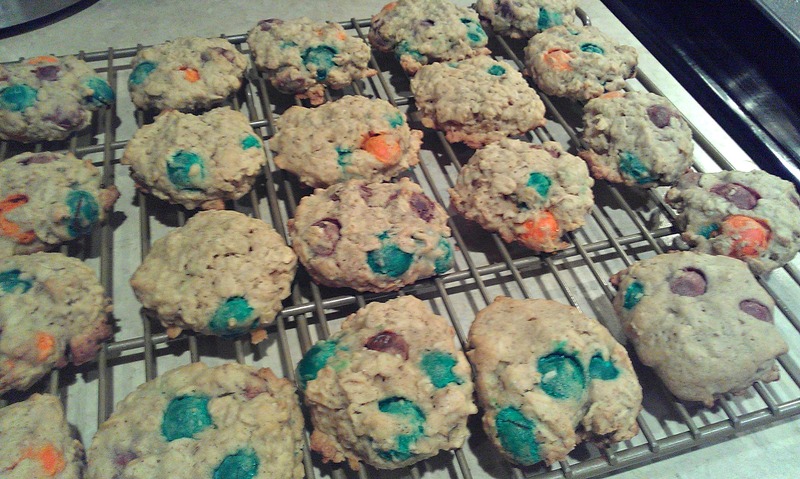 I was feeling some oatmeal cookies and decided to give a Martha Stewart Living recipe a try. They turned out really good! Not too hard and I like the subtle taste of the pumpkin spice M&Ms. I have a couple late nights at work ahead of me tonight and tomorrow night for parent/teacher conferences. I’m a busy speech bee that’s for sure! On the plus side though, I’m able to leave at 9:30am on Friday and my hubby and I are celebrating our second wedding anniversary this weekend! Have a great Wednesday, friends! 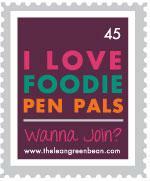 I’m linking up with Jenn at Peas and Crayons for What I Ate Wednesday! Make sure to check out what everyone is eating lately! What was your favorite dessert this week? Are you using any seasonal produce in your recipes? 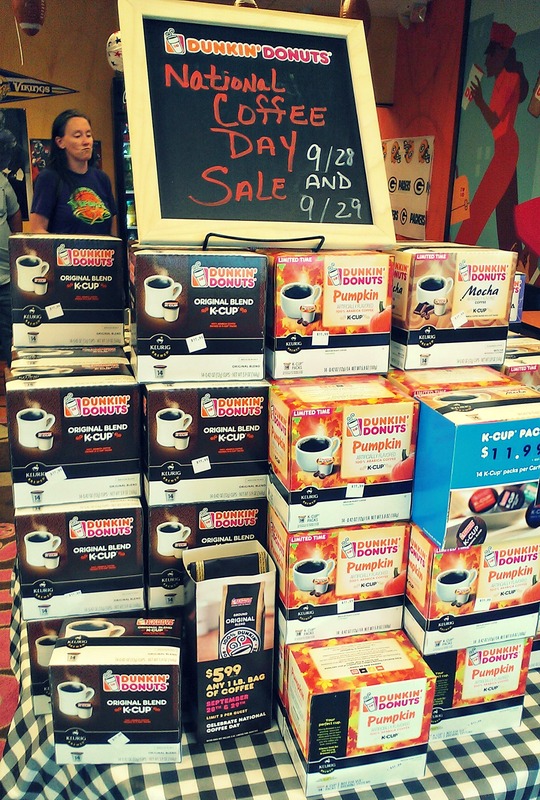 Well, it’s almost fall as we all know. 🙂 Seems like you are either on the pumpkin train or you’re not. Guess what? I AM! 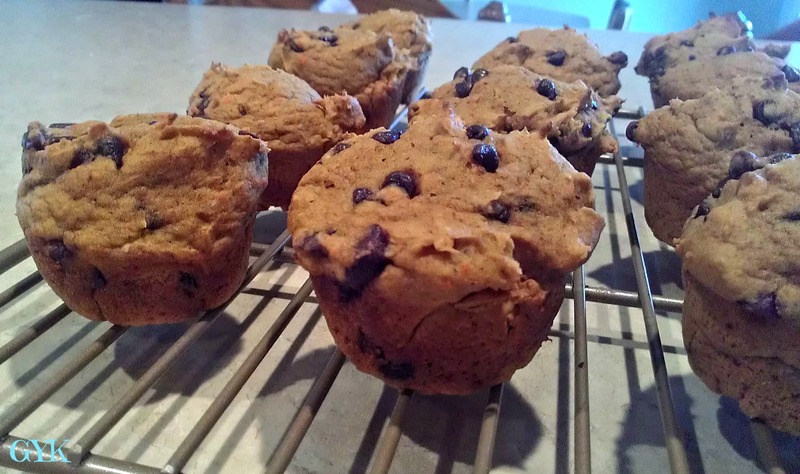 I look forward to making these muffins every fall and while I could make them at any time of the year, there’s something extra special about pumpkin muffins in fall. It’s the ambiance of the season that makes these taste so much better. Another plus, they really are the easiest muffins to make besides going out and buying your own. I originally found these muffins on Hungry Girl’s website. There are many possible variations (i.e., spice cake mix, devil’s food cake, etc), so if you’ve tried a different version with good results, let me know! Preheat oven to 350 degrees. Mix all ingredients together. Do not add anything else. Spray mini muffin pan with non-stick spray liberally. Fill mini muffin tin 3/4 full with batter. Bake in the oven for 16 minutes. Let cool. I make mini muffins because then I can have two and still think in my head, “It’s like having one big muffin.” I love mini things; mini candy bars, mini chocolate chips, mini muffins. No research behind this, but I definitely think they taste better than those regular size muffins.